8 silences offers a sensible representation of Internet by broadcasting audio streams that travel and reverberate trough the web. Initially silents, the streams progressively incorporate an infinity of transformations or “errors” that modify the sound as it circulates on the network. These alterations are comparable to a form of erosion caused by the network space – they are a key to allow different mental representations of this digital topography. Presented as a live performance, 8 silences is a sound immersion in the heart of data flows. 8 silences is a live piece made from mixing together several silent ogg and mp3 stream loops with different quality settings (error corrections are bypassed). Each loop is going to a different location on the globe, and then coming back to the location of the concert venue. Performers stand with a laptop in different parts of the venue (non scenic performance). The audio streamloops are exchanged in wifi around the public. The imperfections allow to identify a medium, in the style of glass becoming visible by the accumulated dusts and scratches. 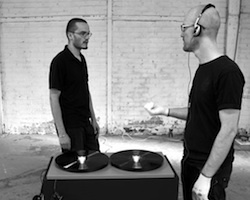 Within the ART OF FAILURE collective, Nicolas Maigret and Nicolas Montgermont experiment the capacity of the contemporary technologies to generate specific sound or visual languages. In their realizations, the internal characteristics of the media are revealed through their errors, dysfunctions, borderlines or failure threshold, which they develop sensory and immersive audio visual experiences.